This book arrived a couple of months ago compliments of the good people at Wine Australia. But on opening it the weight settled in. Ugh. 376 pages of drivel on Australian Wine? First - and this we really need to get out of the way - the title was likely conceived by a focus group of marketers who said, "No way is anyone going to buy a book titled 'A Modern History of Australian Wine'". They may have been right about that and they may have been right that a catchy title like the one it ended up with would help sell books. But the few mentions of the French and the hate/envy they allegedly feel towards the Australian wine scene seem to have been sprinkled into the book after the title was chosen. This is forgivable since these publishers aren't the first - or last - to use a flashy cover for the sake of marketing. Hell, this website was almost given the name Winegasm.com. 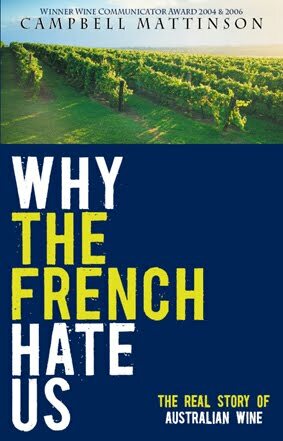 Anyway, what this book is about is Australian winemaking - the history, the landscape, the wine, and - more than anything else - the people. The colorful, passionate, hard-working folks who have helped create one of the fastest growing economic juggernauts in recent history. But Mattinson's message is that there is more to Ozzy wine than Yellow Tail. There is finesse, there is nuance, and there is quality of extraordinary measures the world still doesn't know if. He tells the stories of the personalities behind the wines well, with writing that is brilliant at times and otherwise entertaining. If the prospect of reading a book so focused in subject matter is daunting, the writing, humor, and passion makes it easy to get through. Well, at least the first 175 pages. It then levels out into a long (very long, 150 pages long) series of tales of select wineries before a somewhat awkward finale. The format of the book is a little herky-jerky making the flow more choppy than winding, though that won't stop me from returning to it - and those 150 pages of stories - as reference in the future. Still, this is a good read. The history and changes coursing through the industry, from biodynamics to rip-and-replacing vineyards, is astonishing - as is the size and diversity of winemaking in Australia. Mattinson's attention to detail and extensive quoting of winemaking legends makes for often captivating tales. As for the book's heft, is there really 367 pages worth of content? Easily. More importantly, however, is that the book achieves its goal, which, contrary to the title, is not about spiting our frog friends, but about enticing the reader to dig deeper into Australian wine - to get beyond Big Fat Parkerized Shiraz complex. I know I will. I already have. cheers and thanks for the kind words! Appreciate your candor and thanks for stopping by Winehtropology!